Contained in a red wheelie bin for easy identification in a spill situation. The kit can be mobilized and deployed by one person. 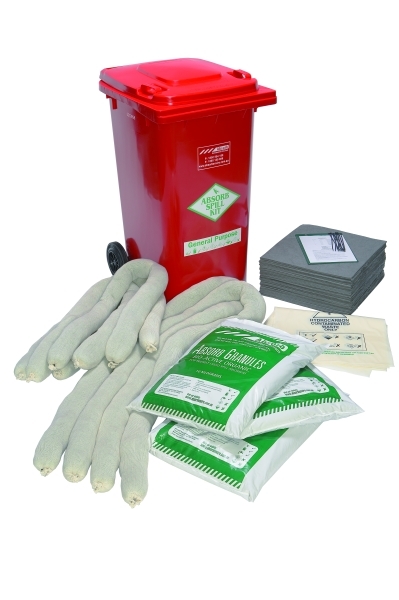 This kit includes general purpose pads, granular organic absorbent and organic booms. Use this kit for general spills of hydrocarbon and water based liquids. * Factories and workshops where a potential emergency spill may occur. * Don’t use this kit for agressive chemicals including acids and oxidizing agents. Instead, use a hazchem spill kit. * Check with Absorb to discuss which size kit is appropriate for your site.